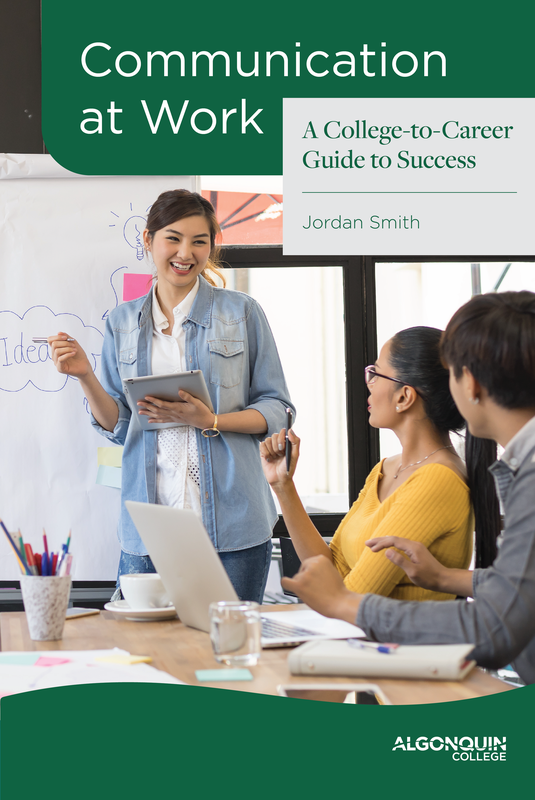 Book Description: This open educational resource is designed to guide first-year college students in developing the vital communication skills that will help with the real, everyday tasks of writing and speaking in their chosen profession. Organized in three major units—Communication Fundamentals, Applied Writing, and Oral Communication—the textbook is conveniently presented in a variety of AODA-compliant formats and written in the reader-friendly style of a professional email between colleagues. By meeting the learning outcomes of Algonquin College’s first-year Communications course ENL1813 and its follow-up ENL1823 or equivalent, the textbook helps ensure that students graduate with the communication skills necessary to succeed in the modern workplace. Communication at Work by Jordan Smith is licensed under a Creative Commons Attribution 4.0 International License, except where otherwise noted.